Whether you are stocking your supply yard or creating your own landscape project, we have quality products at a wholesale price! 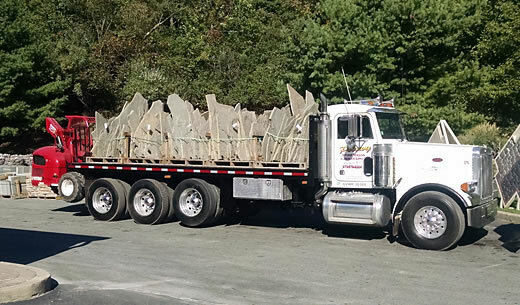 Being family-owned and operated, we take customer service to the next level making our business and customer relationships as solid as a “ROCK!” We specialize in Garden Stone (Moss Rock) – great for waterfalls and retaining walls, as well as decrotive landscaping stone. Bluestone and Long Island Landscape Boulders – are harvested in old abandoned quarries along the Delaware River – they are rare are rich in color and are covered in lichen and moss, which makes them great for just about any landscape project. To contrast with these landscape stones, we create Custom Pool Coping, Walkway designs and Steps out of our New York Bluestone. When you combine our garden stone with our bluestone you will get a natural look that you would see in the great outdoors. Homeowners and contractors can chose from a large selection of natural stone products at our supply yard. We have everything you need to get your natural landscape project done quickly and correctly. Our staff is available to answer any questions and will guide you through each step of your project. Polowy Brothers, LLC in Lafayette, NJ is ready to serve you!